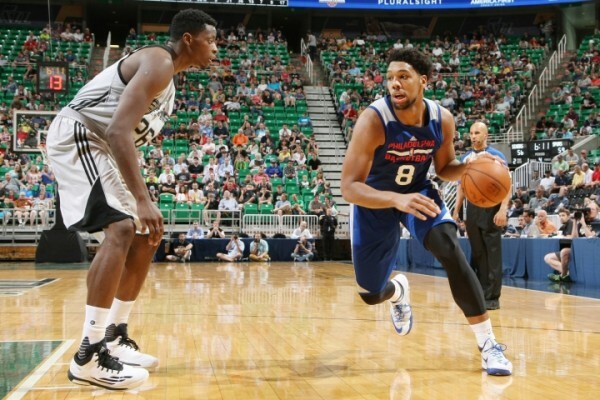 The third day of the NBA Summer League meant spreading out to other locations. Games were still going on in Orlando, with Myles Turner, Mario Hezonja, Aaron Gordon, Mitch McGary, Justise Winslow and Stanley Johnson doing well as usual, while in Salt Lake City Jahlil Okafor had a nice debut, while Marcus Smart and Dante Exum stole the show from the rookies in the other game. Okafor scored 18 points for the Philadelphia 76ers as the lost 71-74 to the San Antonio Spurs, grabbing 10 rebounds as well. He shot just 9-of-21 from the field, but it wasn’t a bad way to start what should be a long and productive professional career. In the other game in Utah, the Utah Jazz beat the Boston Celtics 100-82. Marcus Smart missed a lot but still finished with 26 points and 8 assists in the C’s loss, while rookie Terry Rozier had a more difficult time, scoring just 7 points in 28 minutes. Dante Exum, the high disappointing pick from last season scored 20 for the Jazz, looking bigger and more ready for the new season. He ended up spraining his ankle which might curb a little bit of the enthusiasm and momentum. Rodney Hood, another second-year player, led the Jazz with 23 points. Trey Lyles didn’t play. In Orlando, it feels like these are old, familiar faces. The Miami Heat beat the Detroit Pistons 78-73, with Winslow scoring 17 points. Johnson once again led Detroit with 14 points, once again shooting very well from all ranges. Oklahoma City beat the Orlando Magic Blue team. Mitch McGary, heading into his second season, scored 19 points for the Thunder in a dominant display beneath the basket. Their first round pick, Cameron Payne, is still injured. Aaron Gordon had another double double with 21 points and 10 boards. Hezonja pulled off the play of the day with a huge dunk and another impressive moment for him in the summer league action. The Orlando White team beat the Indiana Pacers 85-76. Turner scored 13 points and grabbed 9 rebounds in the loss, also having six blocks.